Now Available the New RELEASE 2.0 with more features! Thanks to the SD card onboard slot up to 32 GB, it is possible to configure up to 32 maps (images, pictures, plans) and include in each map up to 16 objects (zones and outputs) that will give information on the status of each single zone in real time. 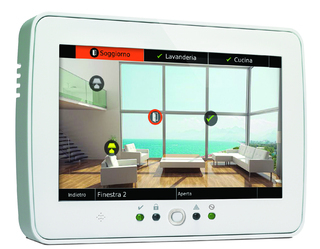 It is also possible to browse or activate home automation scenarios (gate opening, garden watering, lighting control, etc.) directly from the map, with just a touch on the screen, for an even more intuitive use of the keypad.